The pattern I wrote about last month, Jamberry, is finally being published today. It was a long time coming, since I began writing this pattern back in September and it is a small piece of knitting as knitting goes. My inspiration for this was some yarn I purchased in the city in August. It’s Trensetter’s Vigna. I admired it at Gotta Knit and had to have it, although I had already spent more than enough at another yarn shop earlier in the day. When the owner asked what I was making with it, I said without thinking, “a little girl’s dress.” I don’t know what made me say it, since my “little girl” is now 17, but I believe in fate, so it had to be. 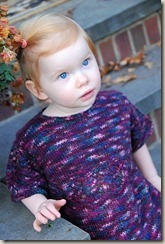 The pattern is named after one of my children’s favorite books (when they were littler, of course) by Bruce Degen. 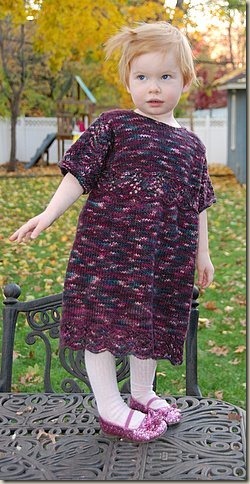 I’ve always admired Debbie Bliss children’s patterns because they’re so roomy. I wanted to make this dress comfortable for the wearer because I remember fussiness in clothes and small children rarely go together. I also wanted to make it pretty without being “overdone.” The dress has lace at the hem, bodice band and sleeves. Other than that, it’s all stockinette. It’s a quick knit, so why the delay? The delay also comes because this is the first time I’ve used a tech editor AND test knitters. I’ve been reading a lot on Ravelry these days about tech editors, but didn’t think I could afford one. Now I don’t think I can afford NOT to have one. Jaya, who was wonderful, did the tech editing for me, and looking at her spreadsheets, got me to bite the bullet and sit down to use Excel myself for my patterns. She was well-worth her fee. I also used a fantastic group of test knitters from Ravelry – Amy, Beverly, Carina, Courtney, Heather, and Rose. They were enormously helpful and caught mistakes that I didn’t, as well as kindly letting me use some of their beautiful pictures. Some designers say they use either a tech editor or test knitters. I think both for me. 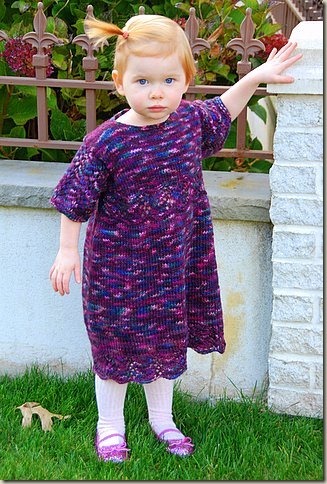 Th is comes to the final reason Jamberry was delayed…no 2-year-old to model the dress. All of my friends have children around my daughter’s age. I don’t have grandchildren and the one 2-year-old girl in my extended family is extremely tall for her age. Enter my good friend, Sima, who happened not only to have a two-year-old in her neighborhood, but an extremely talented photographer, Lauren, living nearby as well. (Check out Lauren’s website.) Meet the beautiful and talented Samantha K. Isn’t she gorgeous? 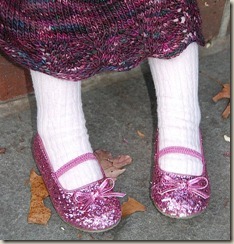 She did an awesome job and don’t you love the pink, Dorothy-esque shoes? Big thanks to her mom, Karen, for allowing her to do this. To fit baby/child’s sizes 12 months (18 months, 2, 4, 6). Skills needed: working in the round, increasing and decreasing.